It appears on Facebook, on Twitter, on coffee mugs, and on signs in doctor’s offices. Today I found out that there’s a doctor who sings about it in English and in Swedish. Don’t confuse the 1-hour lecture you had on my condition with my 20 years of living with it. My contribution to the public conversation has generally been national survey data showing that the horse is out of the barn on this one, at least in the U.S. The vast majority of Americans of all ages have access to the internet and the majority say they have looked online for health information. As I’ve written elsewhere, Dr. Google is, for many Americans, a de facto second opinion. For some people their best hope is to connect online with other people who share their symptoms, diagnosis, or life stage. What I’d like to do is open a thread about our answers to these naysayers. If you’ve got a favorite study or article to cite, please share it. What evidence do skeptics need to read in order to catch up to us on the path of understanding? How might we respectfully change their minds? Beyond data, let’s hear some stories about how a search online has led to information that helped you in some way with your health or in taking care of someone else. It could be big or small, life-changing or not. What story would you tell someone who doubts that the internet is useful — even essential — to navigating health care? On what turned out to be the last day of my Dad’s life, I used Google to search: “what does dying look like.” Dad met nearly every sign and symptom. I was alone in the room with him at the time; Mom and the nurses were taking a break. No decisions needed to be made. That’s not what that Google search was about. It was about having the information I needed to make my own choices about how to spend that day. I held his hand and stayed. What’s your story? Comments are open. This blog post hits the message home and out of the park. Stellar synthesis of the reality, Susannah. Thank you @JHMarble, LoomesGill @JennyR23 @debimasseywm and all those who continue to raise awareness that there is expertise in experience that has value to add in a team approach. I am an NHS Librarian, so my article came from Medline, not Google. It is also important for doctors to remember that the patient could be a Librarian, a nurse, a researcher…. That consultant had known my profession but didn’t bother to remember, so deserved to look stupid. I have another consultant who always expects me to be up to date on new research. We have some really interesting discussions. Yes! Clinicians should never assume that they know the training or background of the person in front of them (nor the people who surround them, such as a nephew or neighbor who is a nurse or librarian). And “Dr. Google” is indeed a catch-all phrase for all search engines, all online resources. My story: I self diagnosed a recurrent bizarre skin rash, fevers and vomiting as an allergic reaction to Nexium. After seeing ID, derm and transplant specialists, and having 3 stays in hospital. The best the derms could do was give me a WebMD print out of the type of rash it was (yep, I’d already worked that out for myself) but couldn’t diagnose the cause. Thankfully Google let me know that this is a very rare but not unreported reaction. I also self diagnosed a few skin cancers with the help of Dr Google. And found my tribe of supportive transplant communities, a few good mates, lots of helpful patient blogs pre-transplant, lots of useful resources for my research career… I could go on. If a doc was holding that mug when I walked in their office, I would turn around and walk out (who am I kidding, I’d probably have “words”). Thanks for making the jump from Twitter! What I’d really like to do is lay out each such story I have in a separate comment here, which is what it deserves, just to have the 100+ stories visible in your comment count. 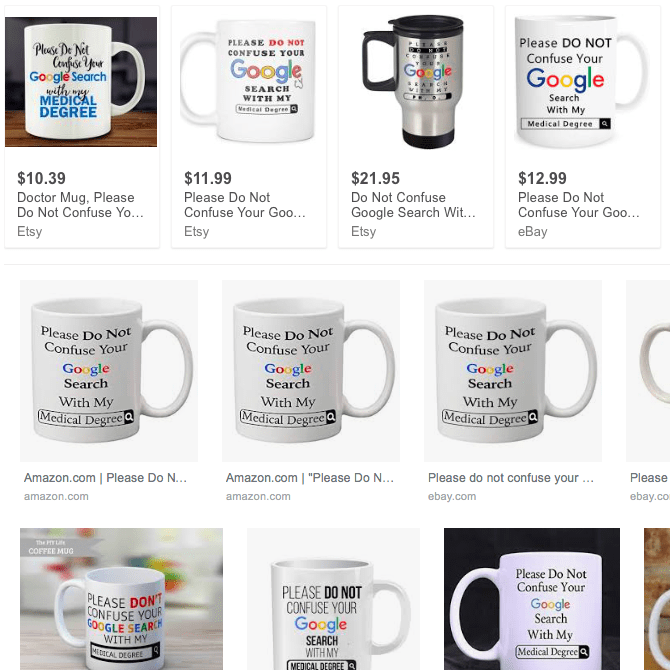 Here’s what I believe to be the so-far-definitive post on this, from e-patients.net: The truth about that “your Googling and my medical degree” mug, which I’ve given the short URL bit.ly/googlemug. Ha! And I’m about to go to a play, so comments may (hopefully) pile up until I’m back from that. Thanks for getting us rolling. I say: anyone who says this isn’t possible is demonstrating their own lack of information, which is pretty dangerous in a physician! The question is: how can we coach all (patients and clinicians) to use the internet wisely and properly, neither believing everything nor rejecting everything? I love that story about your Dad. Such a perfect example of why and when people turn to Google for useful help. I’d bet my next squirt of nitro spray that, if only the Emergency physician who misdiagnosed my heart attack symptoms as acid reflux had bothered to Google: “central chest pain, nausea, sweating and pain radiating down left arm” before sending me home, there is only one plausible search result that he and Dr. Google would have come up with. – and those mugs keep cropping up regularly. Instead of ordering another stupid mug, why don’t physicians simply curate a list of credible online resources that they recommend their patients use to help inform their decisions, print them as if on a prescription pad, and hand them out? Patients are already online. I wouldn’t buy a coffeemaker without Googling first – why on earth wouldn’t I Google distressing symptoms too? And Clalit, the biggest HMO in Israel, had this E.R. drama commercial, in which a patient is wheeled in with all kinds of symptoms. Wife says he was searching about his cough – “How many results did he read? ?” “Tens, maybe hundreds.” All the docs’ eyes rolling. “CLEAR!” yells one doc and slams his laptop shut. Love this example. What we dont need is further disrespect. We need way to partner gracefully. Peter learned about participatory medicine at some speech I gave in Maine, where he lives, and said he’d always practiced that way – just didn’t know it had a name. She was a patient with long-standing irritable bowel syndrome (IBS). She had had a thorough evaluation, first by me and then by a gastroenterologist. She had had blood and stool studies and upper and lower endoscopies. Because her symptoms had seemed to develop in association with a job change (promotion) we had discussed the possible role of stress and she had seen a counsellor and followed through with relaxation training. She was on a combination of imodium, fiber, exercise and bed time amitriptyline. We had tried cholestyramine, empiric treatment for Giardia, and diphenoylate/atropine (Lomotil). Yes, she had improved on this regimen, but had remained unhappy with her symptoms. She was still taking the amitriptyline, but largely for sleep and to prevent her intermittent migraine. She used imodium for travel, but said it was for psychological reasons – she had forgotten it several times and had had no problems. What was the solution, I wanted to know. She had had some spare time in an air port, and spent her time googling IBS and chronic diarrhea. Her Google searches led her to a reference to a case report in The Lancet from 1995 of a flight attendant with sorbitol induced diarrhea. She described pulling her breath mints out of her purse and reading the label: sorbitol was the sweetener. She threw them out and experienced a dramatic resolution of her symptoms. In retrospect, she said, it was obvious. Her episodes of bloating, cramps and diarrhea occurred most often in association with travel for meetings, big work surges and important presentations, all times when she used lots of them. (We had interpreted this data as a stress response. That was a very enjoyable visit. We had both been frustrated with our regular conversations about her irregularity (pardon the humor) and our inability to fix it, and we were happy to enjoy her triumph. But it was especially nice for me, because I remembered a patient from several months earlier, also struggling with bloating and diarrhea in the setting of known IBS (and a negative evaluation) His flares seemed to be associated with intermittent periods of alcohol excess, and he had not been thrilled with my speculation that the alcohol was causing his flares. Yes, he did agree that his flares rarely happened in the absence of alcohol excess, but he often drank with no flare. What struck me that day was that he was a salesperson and therefore very sensitive about alcohol on his breath. I knew that the heavy mint to his breath was a signal that he had already started drinking that day. After work I called and asked him to look at his mints to see if they contained sorbitol. Yup, He stopped and was much better. Listening to patients is good. Learning from them is better. Letting them help is best. What a great story, Peter. And what a cultural note: “I hope you’re not upset, but I’m cured.” ! Last fall I started getting intense heart palpitations/irregular heartbeat, a ‘hard’ heartbeat that I could feel in my back, extreme insomnia, dizziness, and lightheadedness. It got really bad right before a trip to Japan, and I went to Urgent Care and my PCP for heart issues and had two different echocardiograms (which were fine.) No one could explain what was wrong; they told me to drink more electrolytes, and that I was fine. On my 2-week trip, the symptoms stopped. I was sleeping well and did not have heart palpitations. When I got back, I started googling my symptoms and, in a roundabout way, came upon the topic of Histamine Intolerance, in which high-histamine foods (red wine, fermented foods like chocolate/kombucha/green tea/sauerkraut, avocado, and more) can cause reactions similar to the ones I’d been experiencing. Unfortunately these were my favorite foods – I’m a chocoholic and had also been drinking quite a lot of kombucha on a daily basis – but while on my trip I’d changed my diet and hadn’t really had any high-histamine foods. Since that trip last November, I’ve adjusted my diet and removed or limited those foods, and I’ve been doing so much better. I don’t even know which doctor I would approach with this story; maybe my PCP, who is generally great and receptive to me, but I don’t know if she’d know what to do with this info. Basically, I self-diagnosed based on information I found online, I used trial and error (and luck!) to figure out what my triggers were, and I was able to make my symptoms go away. I’m pretty sure I would still be struggling if I hadn’t taken those steps. Awesome, Katie. So good to see you in DC recently – wish I’d been more present mentally but it was so overwhelming! I’d love to have the chat we didn’t have there. Your story reminds me that as I’ve recently considered the cost and questionable value of US healthcare, I’ve asked myself what we would do in various situations if we had NO access to care. It’s surprising how often the answer comes out like yours. Thanks Dave for the reply and nice to see you too! I have an orphan syndrome. Until I moved to my current city, my doctors were dismissive of my research. Now, my GI team appreciates my knowledge and willingness to learn. It helps them treat me. They willingly admit that they don’t know it all, that they can’t know it all. For awhile, the head radiologist at a local hospital always brought his students to meet me whenever I was in the ER. He “quizzed” me each time for the benefit of his students. He wanted them to learn to respect patients’ knowledge. It makes me feel better knowing that there is growing change in this, that medical professionals are more willing to consider the patient as a team member. Dorie, thanks so much for sharing your story – it’s inspiring! As a nurse and writer who contributes to Dr. Google regularly, I wish physicians and other clinicians could acknowledge that not all health information published on the web is “bad” or discreditable. My work is impeccable sourced, does not overhype claims and undergoes rigorous fact-checking. It’s also empathetic and encourages the reader to seek a clinician for bona fide medical advice. I don’t understand why this situation has to be so adversarial. Dear Doctors: I’m on your team. Let’s make these patients better. Thank you for this. It is so incredibly true. I had fibromyalgia for two decades, and over time, found as much help from patients, case reports, and research on the net as from the doctors and specialists I saw. I tried and traded a growing number of covered Rx drugs for pain and sleep disorder for a growing number of supplements. I will share my longer story some day, it came with a side of breast cancer, and balance problems – literal ups and downs – that made me a frequent flyer in the orthopedics and physical therapy departments. Two decades in, I was starting to lose my ability to work productively, which was deeply concerning. I then had a year of escalating neurological and dermatological hell. Third opinion consults with several specialists at leading Boston hospitals led to a growing file of wastebasket diagnoses that it was all in my head. I knew it was not. I was from a scientific family, raised by an engineer and a math teacher, with two computer scientists for siblings; and knew that illnesses had causes. Finally, due to a functional medicine physician I saw from time to time hearing a presentation at a conference, we learned the answer to my escalating problems: reactivity to dental materials. Over the next few months, with the help of a biological dentist (I had never heard of them before, or knew they existed), I began to get my health back. My team also uncovered and treated additional overlooked, yet mundane, common causes of my fibromyalgia. I was thrilled to regain my health and vitality I’d lost for twenty years. I’m still working on a few things. Medicine isn’t rocket science or aviation or engineering. Maybe it should be, with patients and physicians together, in real time and over the net, “working the problem” until we it out. this is a small but huge for me, ‘thank you Dr Google’. Treatment for the condition I was (finally) diagnosed with called for a Statin. In spite of having raised cholesterol, I was always dead set against Statins. But I was in so much pain, I went for it. Within two days – and on a long weekend – I was having (equally) un-live-able-with side effects. It was Dr Google that provided evidence that reducing the dose to the minimum was shown to be equally effective. If not for being able to find – and decipher! – what Google brought me, I’d have gone to ER. Thanks Susannah, for (yet another amazing) convo you’ve sparked. I am former pharmaceutical representative who has suffered with Rheumatoid Disease for nearly fifteen years. Many times due to comorbid conditions I have received prescriptions for drugs I knew to be dangerously contraindicated if taken together. I will never apologize for keeping a drug interaction checklist on Medscape. There is no universe where a complex patient can be effectively managed by an eight-minute appointment three times per year. My almost 13 year old has a rare trisomy diagnosis that early on placed biases in his care depending on which doc you talked to. His affects c22 but some spoke of it like T21 or T18 when there’s literally no data to support similar outcomes. Things changed for myself and many families down the road when Google helped me find a small study that says the data doesn’t support a dire prognosis 100% of the time. Once I could put that info in the hands of some docs, the conversation shifted to looking at the patient in front of them. Thank you, everyone, for the awesome comments so far. Tell your friends! We need all the evidence we can get and this can be a repository we build together. To the meme “Don’t confuse your Google search with my medical degree” I answer with an old Chinese proverb: “The palest ink is better than the most capacious memory.” In other words, don’t confuse your recollection of a disease with a well written, credible, in-depth description found with google. Did the physician explain things in a way that was easy to understand? Did the physician listen carefully to you? Did the physician give you easy to understand information about your health questions or concerns? Did the physician seem to know important information about your medical history? Did the physician show respect for what you had to say? Thank you for writing this article, and opening the doors for all of the wonderful comments so far. In my own experience, Google has been phenomenally helpful for my own chronic disease understanding and management (though, admittedly, less helpful for one-off “rashes” and other items where I have an information gap, but not enough experience to sort through the noise– a problem that might contribute to a lot of the frustration on the physician side). When I was first diagnosed with an idiopathic condition, my neurologist said, bluntly, “There isn’t really anything else we can do. Maybe it will get better, but probably not, and there aren’t any other tests that will help us to know more.” This turned out to be false– there were several other conditions with overlapping symptoms but different courses of treatment– but it was a huge struggle to bring information in a way that providers would act upon it, and one that was insurmountable, at times, given the symptoms of my illness. There’s a ton of quackery out there, which makes life worse for patients and physicians alike, but also so much wisdom in both patients’ lived experience and in the enormous realm of scientific research that no single person can possibly keep up on (and certainly no doctor could be expected to keep up on the thousands of different ones present in just their own panel of patients). Here is a place where technology can help tremendously. We hear from individuals every day that have been told by their physician not to worry about their high “bad cholesterol” (LDL-C), that it is inherited, and there is nothing they can do. This is with individuals whose LDL-C is 4 times the normal limit because they have a genetic condition – familial hypercholesterolemia (FH) – that most physicians and the public are not aware of. A person with FH faces 10 times the risk of heart disease as someone with normal cholesterol. After being turned away from the ER several times and having a heart attack at 38, Katherine Wilemon, the FH Foundation’s founder and individual with FH, set out to change this through research, advocacy and education. We are thankful every day that someone Googles, finds our website, and gets a name for their condition – familial hypercholesterolemia. They can join a community to share information with other individuals with FH, and get armed with information to get the diagnosis and treatment they need. Most importantly, they will no longer be one of the 90% living with this condition who are undiagnosed. Dr. Google is a life line for so many in the ultra rare community. My daughter has Timothy Syndrome. When she was born, there were only 20 world wide with her condition. Her life expectancy was 2.5 years. We were racing a clock with almost no doctor knowing what it even was. Google found us a community of parents…Google made me wonder if a drug not previously tried may be beneficial. I was able to bring my Google research to her cardiologist who said we could try it. A lot of her non cardiac symptoms have disappeared. She is 5 now, and has not been hospitalized with blood sugar issues or infections, or respiratory issues in 2 years. But Google is more than that. Through Google, you have access to papers, written, not just by the people who are studying Timothy Syndrome, but by those who are studying more common diseases that may help. And I have yet to meet a researcher who doesn’t email back when you read the paper and ask questions. That kind of open communication for the treatment or research into treatments did not exist before and would not exist without Dr. Google. When my mom first heard of Hunter Syndrome (MPS II) from a TV show and told me, I googled. I watched every available video (few), read research articles, webmd, etc, listed matching symptoms, but also looked at many photos to identify the matching dysmorphic features in my son. Then I took that list of 17 symptoms to my son’s pediatrician. At the end of his 2yo appt, I told her I thought he had Hunter Syndrome. She said, “What makes you say that?” Enter list of 17 symptoms from me and Dr. Google. She left the room and probably conferred with Dr. Google. Sure enough, he had Hunter Syndrome. His symptoms were mild enough at the time that he probably would not have been diagnosed for 1-2 years. That’s 1-2 years without weekly enzyme replacement therapy which helped his body, but even more important, he would likely have missed the window to qualify for the clinical trial he enrolled in less than 2 years after diagnosis. Without that trial, instead of reading, swimming, running, making his own breakfast, picking out his own clothes and dressing himself, independently toileting, telling jokes, and saying, “I love you Mom,” he’d be at end of life. So basically, my mom, the show Mystery Diagnosis, me and Dr. Google saved his life. That experience made me passionate to (1) add more videos online for those uncertain or newly diagnosed families, (2) write online about symptoms I knew were associated with Hunter Syndrome but not in literature, (3) increase (smarter) awareness for earlier diagnosis, (4) fund research to give my son and boys like him a future, and (5) help design better clinical trials for Hunter Syndrome so they can accurately measure what these drugs are doing. Thank you again for all the amazing comments (and for making the jump from Twitter to write them). Here are some quotes from other people, reacting to this provocation: When has Dr. Google been there for you? Richard J. Scully tweeted: “This meme is Very out of touch as we continue the disintermediation and consumerization of healthcare. Casey Quinlan tweeted a link to her own blog post related to the democratization of knowledge, which includes these words: “Co-creation of anything – from dinner to a decision about cancer treatment – requires all involved to be present, and equal, in the task at hand. That’s a particular problem for underserved or disadvantaged patient communities, and in the factory model that healthcare has become for much of the clinical side, of healthcare delivery. So what’s a patient, or a doctor, to do? The most powerful force in healthcare system transformation is yet to be fully unleashed, but the shared decision making approach so thoroughly explored in this book could cry havoc, and unleash the dogs of full partnership. Because if people, and the medical professionals who care for them, actually form an ongoing partnership, “system transformation” will happen without the need for yet another million dollar blue ribbon panel convened in service of answering that thorny “what do patients want?” question. Dr. Fratkin posed this question to a room full of palliative care clinicians. Not a single person raised their hands. Since this blog is my outboard memory I want to capture a few more insights that flickered by on Twitter this past week. And I should note that it was a tweet by Sara that pushed me over the edge to write this post (after months – years! – of seeing similar provocations). And it is a conversation that Sara was part of this week that prompts me to add an important caveat: For those who are living with anxiety, Dr. Google may NOT be a good resource. Anxiety is a real danger for some people and I want to be sure we’re not dismissing that as we advocate for people to gain access to the information they need to solve problems. > gain access to the information they need to solve problems. Note that I’m not arguing with what Susannah said – I said it’s an eternal question. As recently as the 1960s and 70s it showed up in medicine in everyone’s fear of mentioning “the C word” or “the big C” instead of “cancer.” Jerome Groopman’s wonderful book “Anatomy of Hope” tells of how he was taught back then that it was his RESPONSIBILITY to shoulder the burden of that terrible knowledge, rather than ruining whatever time the patient had left. This is the most perfect example of paternalism I’ve seen – a kind heart attempting to relieve the suffering of someone who couldn’t possibly do anything … precisely as a kind-hearted person in a certain mindset might do with a very young child. Somehow the image that comes to mind is a parent who knows their plane is crashing, not trying to explain it but just holding the child tight while the inevitable unfolds. Of course today we can look at that image and ask how many assumptions in that paternalism are universally valid, and how young a child would have to be for that level of “you wouldn’t understand” to be true. What I want many medicos to understand – including the kindest hearts – is that some of us very much want to know, and may even be able to help, as the anecdotes in this thread show. And yes, it becomes an additional skill for you to develop – another important form of shared decision making, patient-centered care, patient autonomy. My chronic disease (polymyalgia rheumatica) is well managed by my doctor – in part because I have loads of information from the internet, both medical info sites and moderated forums, regarding dosage of my medicine (prednisone) and management of side effects without additional medications. Google has helped me be a partner in my care; I’m better off and my open-minded doctor is better informed through me! Thanks for sharing your story, Jean! I was in treatment for breast cancer when I had a hysterectomy. Since I was now post-menopausal (via surgery), my oncologist switched me from Tamoxifen to Femara as a long-term oral chemo treatment, which is the protocol for post-menopausal women. The arthritis-like symptoms hit me hard and fast. By the first followup appointment, I had already taken four cortisone injections in my fingers and had to have surgery on a thumb joint. My doctor would only say that the drug didn’t “cause” arthritis (duh). As a health care writer, I accessed studies, but it took googling chat rooms to find out how common these symptoms are with Femara. Studies referred to the symptoms only marginally, so my doctor didn’t want to take me off it. She kept saying the Femara was “twice” as effective for patients like me than Tamoxifen. I finally asked her to show me the exact numbers, and it was the difference between a 2% chance of recurrence and a 4% chance. After she point-blank told me she (a) would not report my experience to the manufacturer and (b) didn’t believe in shared decision making, I walked out of there with a Tamoxifen script and found a new oncologist. > how common these symptoms are with Femara. Sandy, something in how you worded this spotlights another aspect of the democratization not just of knowledge per se, but democratization of being heard and who decides what deserves to be heard. Our model for centuries is that the learned should observe and report their findings to us, the unlearned. But by golly, that’s the mechanism by which old beliefs refuse to die! Excellent insights, Dave. I believe there’s a maturation and critical mass aspect to building trust in patient-based sources. Consider the trust curve for Wikipedia from initial launch to today. Sandy, Dave, thank you for these insights. If you haven’t yet read Dana Lewis’s latest post about being both a patient and a principal investigator, here it is: Patient in the cage. Her illustration captures part of what we are talking about here — that if researchers don’t listen to people’s lived experience, they will miss the signals they need to see the truth and solve problems. For those who don’t have time to click through or who are sight-impaired, it depicts a patient inside a cage with researchers outside it, talking about the problem they want to study. It’s a truly enormous (in the non-trivial sense) flaw in the model of what information and advice is reliable. And that in turn is built on the assumption that we ourselves don’t (and can’t) know what’s worth knowing. Patients should be as educated as they can in as many ways as possible. As for physicians claiming that they know more than google, that is hubris. But so is thinking that google knows much. Google has partnered with Mayo recently in medicine –something which has harmed rather than enhanced its credibility in my eyes. (We don’t need a credibility censor, we need medical media literacy.) If we look at all the fabric of medical research, the holes in that fabric, the bias in the studies funded, the bias in the publication of studies and the unwillingness generally to acknowledge what we don’t know and to rely on “expert opinion”, it is disheartening. That’s not to say don’t listen to the informed advise, but also don’t rely on an expertocracy that is rooted in a hierarchical power structure that places patients at the bottom. I think this is why more patients are becoming research PI’s to answer the questions that are “research disadvantaged”–the ones patient care about.